And announces a coming ad campaign. That’s not a typo in the headline. 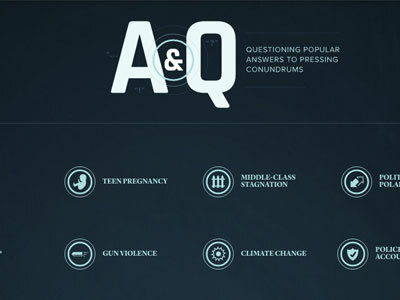 The Atlantic introduced A&Q today, an answer-focused section of its site that questions conventional wisdom on issues ranging from mass incarceration to government research and development. While A&Q reads as “answer and question,” the title of TheAtlantic.com deputy editor Matt Thompson‘s explanatory note about the project—Answers, Questioned—is a more fitting description of the project’s aim. There are currently eight topics that have been dissected by Atlantic writers, including climate change and political polarization, with subsequent topics teased with a “coming soon” promise. They, and other new topics, will be rolled out over the next four weeks. The project is tied to a new ad campaign for The Atlantic, also announced today. The campaign will be handled by Wieden+Kennedy, New York and is set to debut in the spring. “A&Q is a reflection of how we continue to question easily accepted assumptions. The new platform we’re working on with Wieden+Kennedy will express this same spirit,” said Atlantic president and COO Bob Cohn in a statement, explaining how the two relate to each other. It will be The Atlantic’s first consumer ad campaign in eight years.